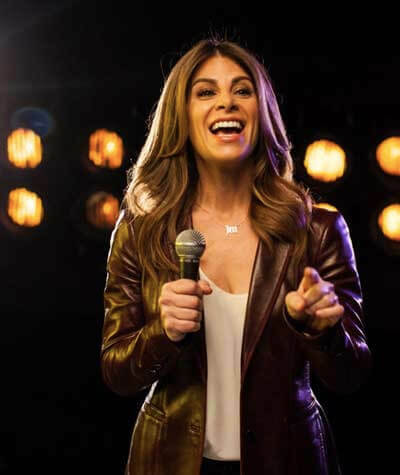 Jillian Michaels brings her “Maximize Your Life Tour” to March 12 at Holland Center. One of Jillian’s biggest Omaha fans, Angel Decker, got the opportunity to interview the fitness expert. Here’s their discussion. Angel: You are a weight loss/ fitness guru, life coach, reality TV star, and author of five books. You have millions of subscribers to your newsletter, your own clothing line, a DVD workout series, an online personal training program and, most importantly, you are the mother of two beautiful children, with your partner Heidi Rhoades…wow! Is there anything you can’t do. The road in life has not always been easy for you. Can you share with us a bit about your childhood and the events that led to you gaining weight? Everyone has a story and their own experiences in life that shape and mold who they are. My life wasn’t exactly hard, but yes there were times that definitely weren’t easy like everyone else. That said, food was always something that I could rely on, something comforting, something I thought I could control, and a way to bond with my estranged father. What effect did this have on your social life and life at school? I was definitely bullied in school and picked on till I was about 15, but I believe that period in my life helped me gain the empathy to be a better adult. What made you decide to turn all this around when you were just 14 years old, and how did you do it? My mom got me into martial arts as an outlet during the time my parents got divorced. This environment empowered me not just physically, but psychologically As I began to feel stronger with my body I began to feel stronger in other aspects of my life as well. That’s why I utilize fitness simply as one of my tools to help people find the courage to change not just their health, but any aspect of their lives they choose to. On your Facebook page you have a quote from Mark Twain. “The two most important days of your life are the day you are born and the day you find out why.” You ask people “What is your why?” Jillian, what is your why and when did you find out? I have many whys actually. Too many to list, but the few that are critical would be family related – having a deeper more rewarding relationship with my kids. Work related – feeling that my work has a purpose and a meaning for myself and others. Tell us about your journey to the Biggest Loser (2005). Did you ever expect it to become the phenomena that it has? When did you first meet Bob Harper, the two of you seem to have such a close relationship, how has it been working with him on the show? What do you think he would say about working with you? What do you see for the future of the show, especially with the latest controversy over Rachel’s drastic weight loss? I actually had no idea the show would be the success it was. I was very fortunate to have had the platform early in my career. Bob and I are very close and we met on day one of season one. We have been through a lot together and share similar values. As for Biggest Loser, I think it will be around as long as people continue to find it inspirational. As I am not a producer of the show I can’t control what aspects of the show the producers focus on. If it were up to me I would definitely show more of each contestants story – how they got where they are and subsequently how I work with them to turn things around. There are definitely choices that have been made with the show that I was unaware of and don’t always agree with and throughout the shows history it’s been tough for me. That said, the show – like anything has good and bad aspects to it and I think the good continues to far outweigh the bad. You have clearly established your reputation as the drill sergeant trainer on television, holding nothing back especially during those lastchance work outs! How well do you think that this reflects who Jillian Michaels really is? BL Jillian is sort of a cartoon character created by the show’s producers. They always cut out the reasons why I do what I do or how what I have done has helped the contestant in a very specific way, because they believe that every show needs a “bad guy – the good news is that people are smart and see through that. Plus you can’t hide an energy or a relationship between two people (myself and my contestants) no matter how you chop of the footage. Over the years there have been a lot of contestants you have bonded with. Is there someone in particular you feel closest too or were touched by their story? Perhaps someone you have met that was not on the show who left a lifelong impression? Without a doubt there is a long list, but I would say the Abbey Rike from season 8 really affected me. She found the courage and the strength to endure the tragic loss of her entire family and ultimately with time to bring meaning to her loss by living a quality life and helping others going through similar tragedies. So in 2012 your family at home doubled! How are your daughter Lukensia and your son Phoenix doing? They are both so adorable. What is the funniest thing they do at home? We know you eat fresh healthy food and nothing else Jillian. How are your children enjoying that? Do you have any tips for parents with kids who refuse to eat their veggies or get drawn in by all the not so healthy options out there? What steps do you take to prepare them for making the choices best for them? My kids are amazing. Truly. I am so blessed. We keep them active by limiting their screen time and getting them into activities they enjoy from dance to horseback riding lessons to rough house play at home. With regard to food we work to find balance. The kids get a small treat every night. And Lu is pretty good at eating her vegetables because she wants to grow up and “roar” like Katy Perry and Katy Perry eats her vegetables. I am sure you have a favorite easy to make healthy recipe for on the go people, care to share one with us? I am actually not a great cook. I work with chef’s to create healthy recipes – I tell them a dish I’d like to make a healthier version of and what ingredients I’d like to use and they help me with the recipe. I say keep it simple. That’s the key to cooking healthy. Fast, simple, fresh. So Jillian, we see your DVDs everywhere, watch you on TV, and see you online doing great work outs. What does Jillian Michaels do when she needs an intense work out and what do you do for relaxation? For relaxation I play with my kids! Kids force you to be in the moment. There isn’t a second to stress about silly things. I also love animals, horseback riding, volunteer work that helps me feel fulfilled. With regard to an intense workout I train with a friend of mine named Dan Salamone. I find it impossible to push oneself as hard as another can. I also like to kickbox, take spin at Flywheel, and do yoga when my time permits. We know you just visited India. Tell us about it. What struck you the most about the people there compared to Americans? I won’t candy coat this answer… there are good and bad people everywhere in the world and India is no different. With India however, the things that are ugly are out in the open where as in America we have the ability to sweep things under the rug. Child abuse, animal abuse, and misogyny are everywhere in the world, but in America it usually happens behind closed doors and in India everything is on display. That said – the kindness and warmth of India is equally as overt. With as much hardship as there is, there are also people helping, trying to ease suffering of others and showing love to the best of their ability. The lessons I learned there are very significant and tough to explain with any sort of brevity. India is a vision quest and must be seen through individual eyes. Should anyone go I promise that it will transform you if you let it. So you are going to be in Omaha March 12th at the Holland Center for your Maximize Your Life Tour! Are you excited about this tour? How was the idea for you to go on tour born and who has helped you carry it out? Has it been difficult leaving your family behind while on the road? What should people coming out to see you expect from the experience? I am thrilled. I love touring. It gives me the ability to have a direct connection and relationship with my audience. I wanted an opportunity to share moments with people and bring them to tools to empower themselves and live a happier and healthier life. Simply put, much like India, this show can change your life… if you let it. I’ll give you the info, the inspiration, and the tools. You just have to show up with an open mind and a willing heart. As for my family on the road, we love it. It can be challenging, but I love that the kids get to see our country and meet a fun cast of characters along the way. Of course we want to know…what are your plans for the future? Honestly… I’m not sure. I’d like to get out a much broader message. Fitness is just one tool I use to help people build a better life, not just a better body. I think the conversation needs to get deeper and expand to touch upon all facets of our lives as human beings on this planet. Professionally I’d like a vehicle that helps me do this on a big scale, but the tour is fulfilling that need in me at the moment. Personally, I’d like to work more on humanitarian efforts and give back some of the blessings that have been bestowed upon me. Most importantly, I’d like to focus on my family and better myself as a mom. There are a lot of famous Jillian-isms out there! Can you leave one especially for these Omaha readers and fans who love you so much?